The Pier at Cromer. 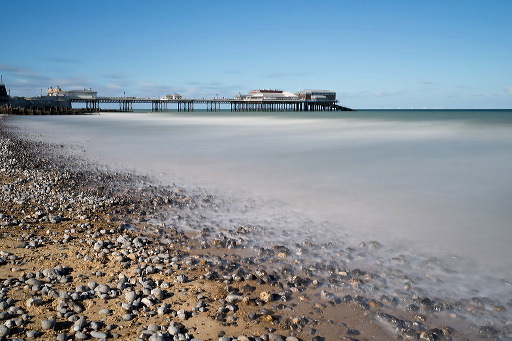 I spent some time walking this lovely North Norfolk beach, enjoying the strong October midday sun and looking for a suitable base for a long exposure of the sea and of Cromer's iconic pier. I was carrying the Lee Filters 'Super Stopper' – their 15-stop neutral density filter – and the sturdy but lightweight Manfrotto Befree carbon fibre tripod. I was careful with the Befree on the soft sand, but it held rock solid for the one-and-a-half minute exposure; a remote shutter release used, obviously. The AF-S Nikkor 35mm f/1.8G ED is very sharp, probably at its best across the frame at f/8 as used here, and with the image at 100% there's excellent detail of the structure under the pier. The only problem with using ND filters is the number of things to remember to do for each shot, missing any one of which wastes a lot of time given the very long exposures!